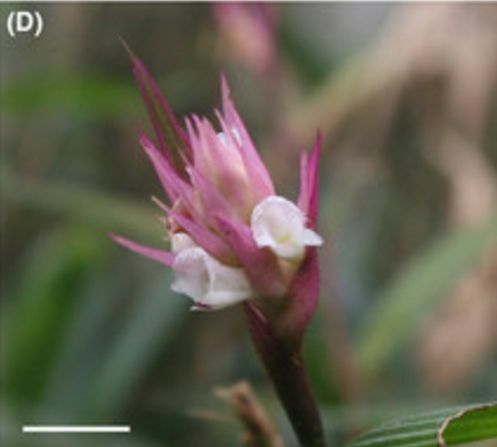 Elleanthus crinipes Rchb.f. 1881 Photo by © C. E. P. Nunes, F. W. Amorim, J. L. S. Mayer & M. Sazima Pollination ecology of two species of Elleanthus (Orchidaceae): Novel mechanisms and underlying adaptations to hummingbird pollination. Available from: https://www.researchgate.net/publication/272157872_Pollination_ecology_of_two_species_of_Elleanthus_Orchidaceae_Novel_mechanisms_and_underlying_adaptations_to_hummingbird_pollination [accessed Apr 12, 2017]. Found in French Guiana and Rio de Janiero, Sao Paulo and Minas Gerais states of Brazil at elevations above 1000 meters as a medium sized, cool to cold growing terrestrial with erect to inclined, leafless below leafy above, rose red stems carrying coriaceous to rigid, lanceolate, long acuminate, 7 to 9 nerved, dark above, lighter beneath, attenuate below into the base leaves that blooms in the later summer on a terminal, erect, spicate, .8 to 1.2" [2 to 3 cm] long, 25 to 30 flowered inflorescence with imbricate, lanceolate, long acuminate, very concave floral bracts.